EECP is a technique that works on the principle of using aortic counterpulsation in order to augment diastolic blood flow. Pressure cuffs are wrapped around the lower limbs of patients and inflated at the onset of diastole, thereby increasing diastolic blood pressure. This has the effect of improving coronary perfusion pressure during diastole. The rapid deflation of the cuffs at the onset of systole also serves to reduce vascular resistance, causing a reduction in cardiac workload.8 The combined effect is analogous to that of an intra-aortic balloon pump (IABP), albeit in a non-invasive fashion. The aim of this study is to assess the effect of EECP on functional exercise capacity and anginal symptom burden in a real-world population of patients with RA, based upon data from one of the few UK centres with experience in the technique. This study was carried out as a single-centre, retrospective analysis of patients who underwent EECP. The decision to initiate EECP was made by the cardiology team following a multi-disciplinary review of patients’ symptoms, medication regimens, results from functional imaging, and revascularisation options. 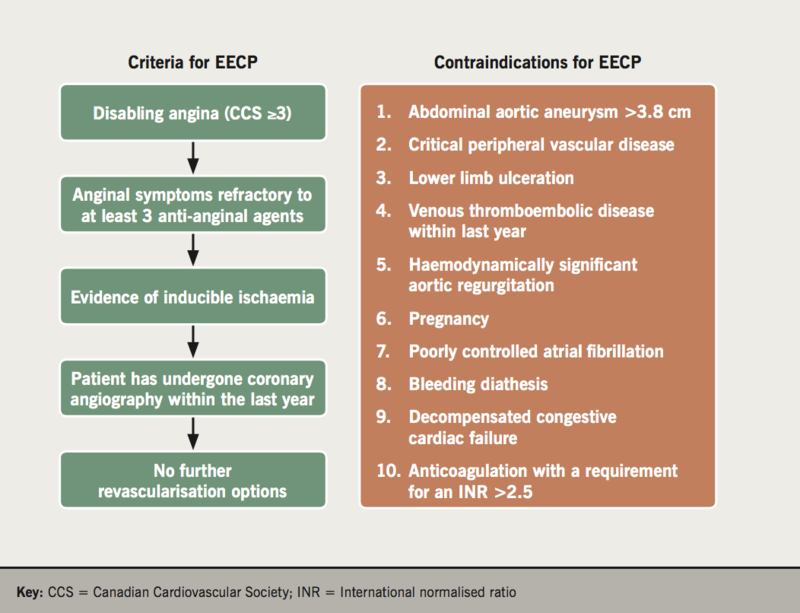 Patients eligible for EECP were those with disabling refractory angina (Canadian Cardiovascular Society [CCS] score ≥3) despite at least three anti-anginal agents, evidence of inducible ischaemia on myocardial perfusion scanning and no options for revascularisation based upon a coronary angiogram from within the preceding 12 months (figure 1). EECP therapy is delivered over the course of seven weeks, with 35 hour-long sessions. Three sets of cuffs are wrapped around the patients’ calves, lower thighs and upper thighs, and patients are monitored by means of electrocardiography (ECG) and finger plethysmography. Timing of inflation is determined primarily by the ECG tracing, with cuff inflation occurring sequentially at the onset of diastole, and deflation at the onset of systole. The plethysmographic waveforms are used in order to monitor systolic and diastolic waveforms, allowing further optimisation of inflation timing. Two weeks prior to EECP, all patients underwent an assessment of functional exercise capacity by means of a six-minute walk test (6MWT). Anginal symptom burden was assessed by use of the CCS scoring system and quantification of anginal episodes per week, both of which were patient-reported. 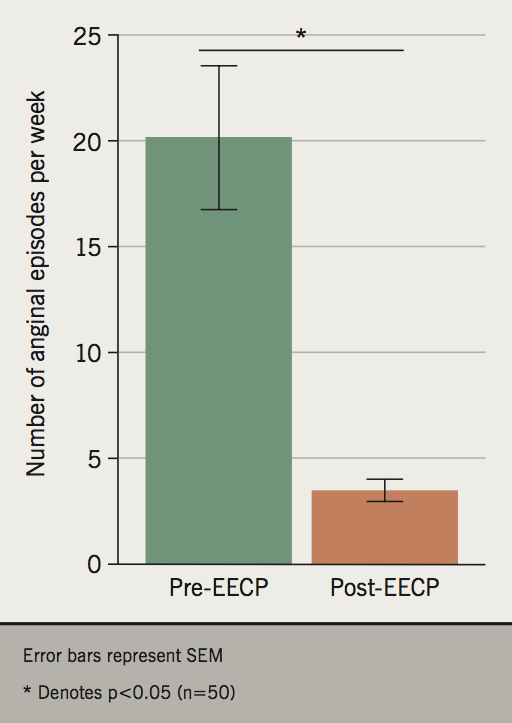 These measures were subsequently repeated two weeks following the completion of the EECP regimen, and the results documented in the patients’ records. Data for this study were collected retrospectively from these records, allowing for a comparison between pre- and post-treatment functional status and symptoms. Further information on patients’ demographics, coronary anatomy, medication regimen, history of revascularisation and functional imaging results was also collected. No changes to anti-anginal medications were made during the EECP treatment period. For the purposes of this study, each patient who had undergone EECP between 2004 and 2015 was assigned a number, and 50 were selected for analysis based on the results of a random number generator. Data collation and statistical analyses were performed using Microsoft Excel for Mac 2011. Continuous variables are presented as means with standard deviations (SD). Parametric data were compared using two-tailed, paired student’s t-test, while the Wilcoxon Signed-Rank test was used for non-parametric data. P values of less than 0.05 were deemed to be of statistical significance. The study included 50 patients (table 1) who underwent EECP between 2004 and 2015, all of whom completed the 35-hour course. The median age at the time of first EECP therapy was 67 years (interquartile range [IQR] 14), and all but one of the patients was male (98%; 49/50). The majority had a history of prior myocardial infarction (66%; 33/50) and revascularisation (84%; 42/50). Over half of the cohort had undergone prior CABG (68%; 34/50) and all but three demonstrated flow-limiting disease on their most recent coronary angiogram (94%; 47/50). Interestingly, one patient had no evidence of epicardial coronary artery disease despite demonstrable ischaemia on myocardial perfusion scanning, suggestive of cardiac syndrome X. The majority of patients in the cohort had a diagnosis of hypertension (66%; 33/50), while a sizeable proportion also suffered with diabetes mellitus (34%; 17/50) and hypercholesterolaemia (48%; 24/50). All of the patients were prescribed at least three anti-anginal agents (including one rate-limiting drug), and the majority were prescribed a statin (94%; 47/50) and either an angiotensin-converting enzyme (ACE) inhibitor or angiotensin receptor 2 blocker (82%; 41/50). Other than the single patient with normal coronary arteries, all were prescribed at least one antiplatelet agent (98%; 49/50). Analysis of pre- and post-EECP 6MWT results demonstrates a significant improvement in functional exercise capacity (282 vs. 357 m; p<0.01) (figure 2). Furthermore, significant improvements were also noted in anginal symptom burden (CCS score 3.2 vs. 2.0; p<0.01) (figure 3) and frequency of anginal episodes (20.1 vs. 3.5 per week; p<0.01) (figure 4). No adverse outcomes related to EECP were noted during the study period. Analysis of the characteristics of the patients included in the present study highlight that the majority are male and have undergone prior coronary revascularisation. 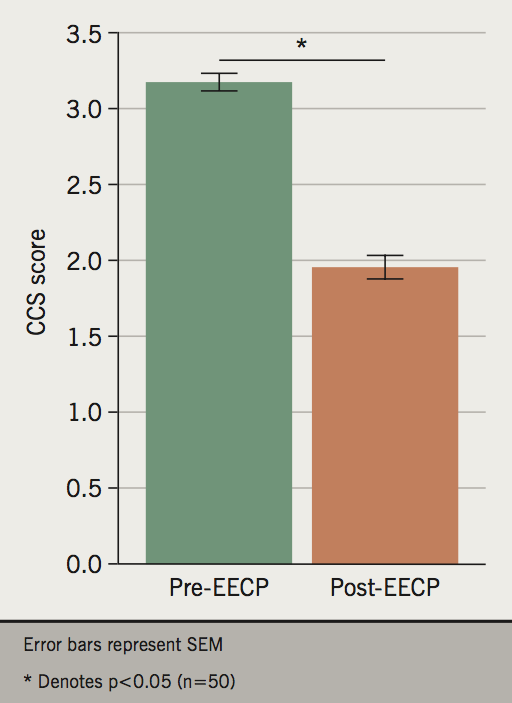 These findings are broadly consistent with those from the landmark MUST-EECP trial.9 Interestingly, the most common pre-EECP CCS score among patients included in the aforementioned RCT was 2. In contrast, every patient included in the present study had a CCS score of at least 3, indicating that our study assessed a more symptomatic cohort. This suggests that the benefit of EECP demonstrated in MUST-EECP is maintained when the technique is applied to patients with a greater symptomatic burden. The finding of symptomatic benefit with EECP in a real-world RA population is encouraging, especially in light of the challenging nature of the condition being treated. Multiple treatment modalities are often utilised, including pharmacotherapy, revascularisation and psychotherapy,16 and, yet, patients with RA often remain symptomatic despite these interventions. Due to the chronic nature of RA, potential new therapeutic options need to demonstrate financial viability, as well as clinical efficacy. In addition to the multitude of studies demonstrating the symptomatic benefit of EECP, the technique has also been shown to be effective in reducing hospital costs in RA patients.17 Data collected from phase II of the International EECP Patient Registry (IEPR-II) demonstrated a significant reduction in the rate of hospitalisation following EECP, resulting in an annual cost saving of $17,074 per patient. While there now exists a significant body of evidence in support of EECP, there remains uncertainty regarding the mechanism by which it delivers benefit. A number of theories have been postulated, most of which pertain to two closely intertwined concepts; augmented angiogenesis and improved endothelial function.8 The raised diastolic pressure resultant from EECP has been demonstrated to be associated with increased shear stress, which can stimulate pro-angiogenic factors such as nitric oxide (NO) and vascular endothelial growth factor (VEGF).18,19 The subsequent increase in angiogenesis is hypothesised to be responsible for increased collateral formation within the coronary circulation. EECP has also been shown to improve indices of endothelial dysfunction, with studies demonstrating EECP to be associated with significant improvements in reactive hyperaemia-peripheral arterial tonometry,20 and flow-mediated vasodilatation.21 Furthermore, following EECP, patients with coronary artery disease have been noted to have a significant increase in plasma concentration of the potent vasodilator NO (estimated via measurement of the stable metabolites nitrate and nitrite), and a concomitant decrease in the plasma concentration of the vasoconstricting molecule endothelin-1.22 Finally, EECP has been shown to be associated with a reduction in pro-inflammatory cytokines such as tumour necrosis factor-α (TNFα) and vascular cell adhesion molecule-1 (VCAM-1), which are known to have deleterious effects on endothelial function. Taken together, these mechanisms provide a potential explanation for observed improvements in perfusion scan ischaemia associated with EECP,23 and, thus, may also explain the consistent symptomatic improvements seen among patients in clinical trials, as well as real-world cohorts. The present study has certain limitations that must be borne in mind when appraising the results. It is a single-centre study with a relatively small sample size. Furthermore, the fact that all of the data were obtained retrospectively meant that there was a dependence on previously acquired data, which may have been of variable quality and validity. Finally, the lack of a control group precludes an assessment of the extent to which the placebo effect contributed to the observed results; the recently published ORBITA (Objective Randomised Blinded Investigation With Optimal Medical Therapy of Angioplasty in Stable Angina) study highlights the importance of the placebo effect when assessing procedural treatments for angina pectoris, as PCI was shown to confer no improvement in symptoms when compared with a sham procedure.24 Nevertheless, while keeping these caveats in mind, the fact that our findings convincingly corroborate those from previously published studies8-12,15 provides validity to our observations. RA is a chronic disease that is associated with debilitating morbidity and compromised quality of life. In recent years, there has been interest in alternative treatments for patients who remain symptomatic despite being established on optimal medical therapy and in whom revascularisation options have been exhausted. EECP is a non-invasive treatment with encouraging evidence in the RA population. In spite of this, it is relatively under-utilised in the UK. The purpose of the present study was to provide real-world data from a UK centre in order to assess the effect of EECP on functional exercise tolerance and anginal symptom burden. Our data demonstrate that a full course of EECP is associated with significant improvements in 6MWT results and CCS score. NA and HJ have contributed equally to this manuscript and have joint first authorship. 19. Masuda D, Nohara K, Kataoka K et al. Enhanced external counterpulsation promotes angiogenesis factors in patients with chronic stable angina. Circulation 2001;104(17 suppl II):II445. Correspondence: is it time for a re-assessment of EECP in the UK?